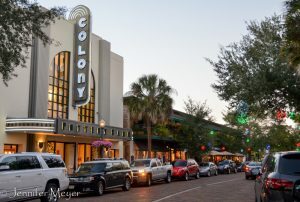 We’d heard from a few people that if we were near Orlando, we should check out Winter Park. So one late afternoon we drove over from our RV park, and we were delighted by it. 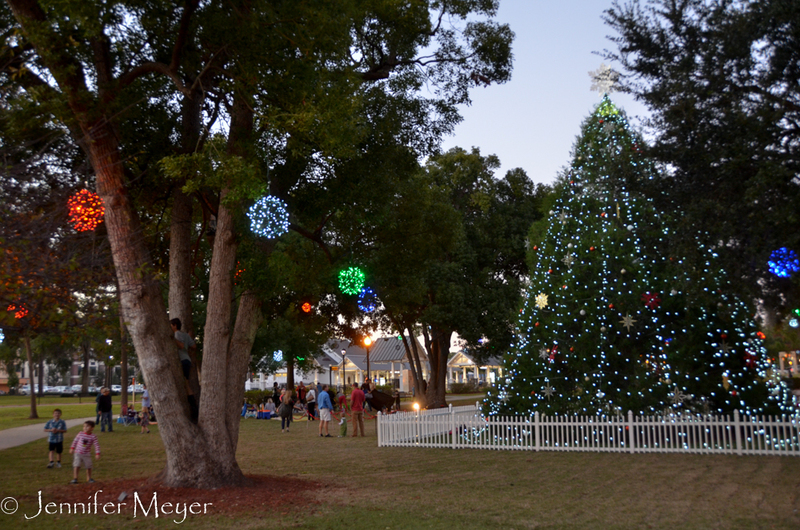 In a sea of theme parks and tacky commercialism, Winter Park was a haven of quaint. We got there late in the day, right at dusk when the Christmas lights were competing with the rosy sky. The main drag has a small town feel, although all the shops are upscale. The old movie theater is now a Pottery Barn. Storefronts that were likely five and dimes and hardware stores are now small versions of Restoration Hardware, Gap, and Nordstroms. Boutiques, art galleries, and sidewalk cafes. No souvenir t-shirt shops here. It had been a hot day, and the balmy evening had a welcomed hint of cool to it. 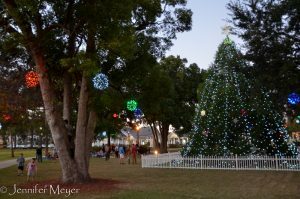 On one side of the street was a blocks-long park where families had picnics spread on blankets; kids played tag around well-lit Christmas trees. How strange to be in this holiday environment with such summer weather! Kate had read about a Tiffany exhibit at the Morse Museum, which is right in downtown Winter Park. Friday nights the museum is open late and is free, but the museum is well worth the normal $5 entrance fee. 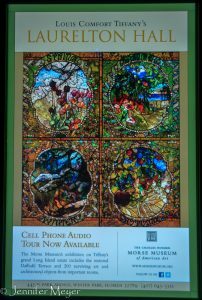 It’s a fairly small museum, with a focus on Art Nouveau and a phenomenal exhibit of the artwork and life of Louis Comfort Tiffany. Louis Tiffany was actually the son of Charles Tiffany, founder of the Tiffany’s jewelry company in NYC. Louis studied art and became famous as an interior designer and multi-medium artist. He’s most known for his stained glass art and for the lamps and vases he manufactured for a broader audience. But he was a painter, jeweler, potter, and photographer as well. In 1905 he completed his family’s country estate home on Long Island, which was a work of art in itself. Eight floors and eighty-four rooms on 580 acres, Tiffany designed every aspect of Laurelton Hall and filled it with art collections. 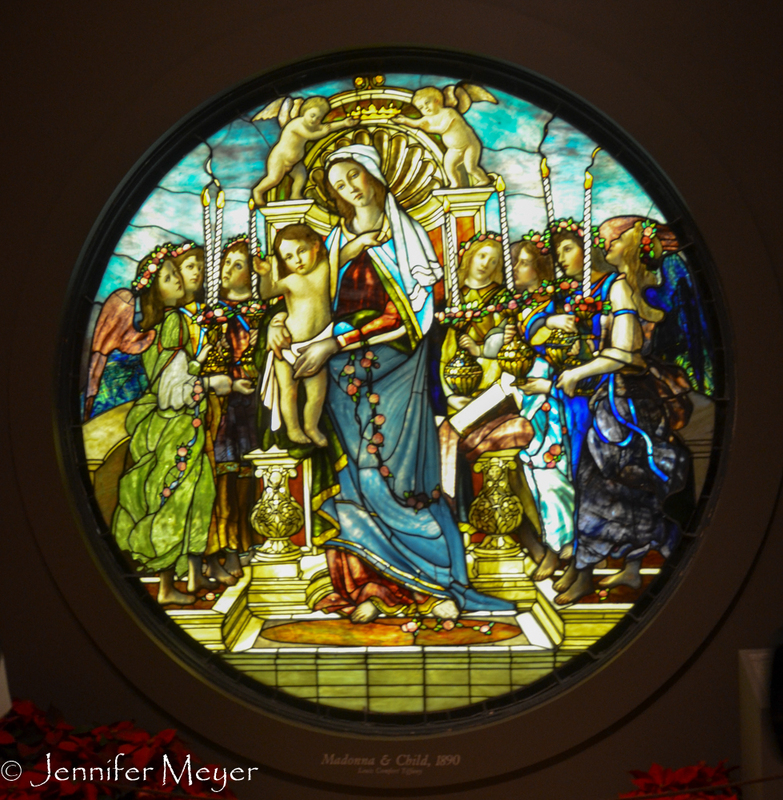 When he retired at 60, Tiffany turned the place into a study center for young artists. After his death, Laurelton Hall and most of its prized art were sold to pay off debts. And in 1957, the estate was gutted by a devastating fire. Hugh McKean, founder of the Morse Museum, had been a student artist at Laurelton Hall in the 1930s. He and his wife, Jeannette, spent decades putting together the Tiffany exhibit in their museum. It includes many salvaged and donated pieces from Laurelton Hall, including stained glass windows, chandeliers, columns, furniture, paintings, art, and even a full-sized chapel that Tiffany had originally built for the 1893 World’s Fair in Chicago. I’ve seen Tiffany lamps, of course, and know the Tiffany name as one of quality and beauty. 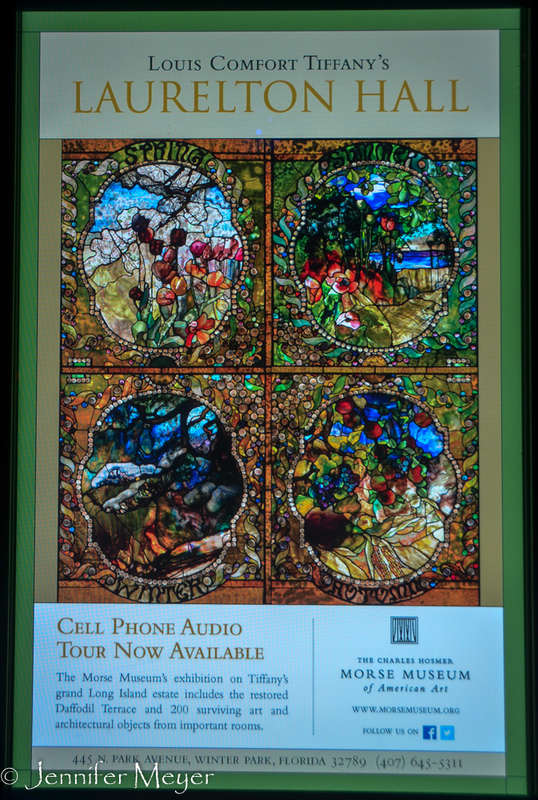 But I had no idea how impressive Louis Tiffany’s pieces were until I saw them first hand. I snapped two photos before I was told “No photos, please.” The first was of Maxfield Parrish’s “Dinky-Bird” (one of my favorites), and the other was a church window. It killed me not to be able to take more, because it was all so jaw-dropping amazing. But photos wouldn’t have done it justice anyway. We finished out the evening with some window shopping, enjoying the balmy, festive atmosphere of a Winter Park Friday night near Christmas. We timed our drive home to be able to pull off the highway near Disney World to view their nightly fireworks show. After several days of just hanging out at the RV park, this was a perfect outing!